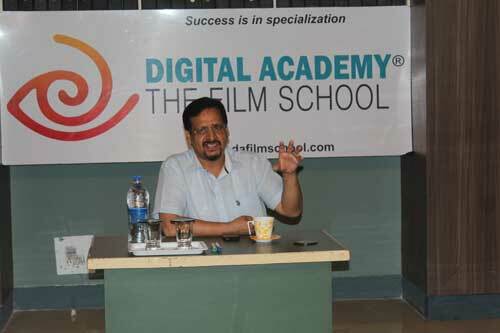 Screenwriter Purnendu Shekhar gave a lecture to DA students on 10th May, 2013. One of the topmost writers of Indian TV series, He shot to fame with Balika Vadhu. He has also written other notable series such as Astitva- Ek Prem Kahani, Saath Phere etc. Strongly vocal in favor of women’s role in and outside their homes, Purnendu Shekhar categorized TV as a modern shaping tool for the family. “To be in the TV industry, we have to understand our families, our own lives, and especially the women at our homes. If cinema is a predominantly male medium, it is the TV which represents the female”, he said. And the essence of TV is in the series. For most of the cases, television serials are known for the roles of the women characters in it. It always begins with a concept – a plot grounded in family relationships. The script elaborates the plot visually, with event substantiation. “Whichever department you belong to”, Purnendu Shekhar addressed the students, “Direction, Acting, Editing or Cinematography, everyone has to understand the script thoroughly, and analyze it.